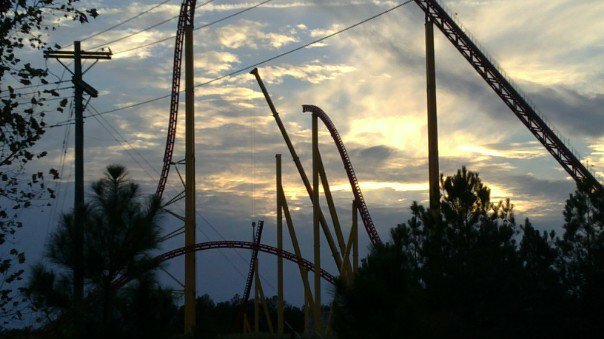 Intimidator 305 rocks my world! They gray outs are weird but yet cool! sixflagsgadvguy1000 wrote: Intimidator 305 rocks my world! They gray outs are weird but yet cool! I've never had gray outs on the ride even before the trims were added to the first drop. Well, I rode it again on halloween and I have to say I like the pre trim ride better. Was even talking to some non-coaster geeks at a party last night and they even said the best part was graying out for them. It gave them a sense of disorientation then bam they are flying over the hill. The straps were more comfortable but going down the first drop seemed too controlled. ^I think the trims made the "twisty" part of the ride better when it still had the hard restraints. Drove by the park today and guess what! Did not have my camera but will try to get pics soon. Guess they are doing some major re-profiling to the ride to eliminate the black out turn. Last edited by pkdcoaster on Wed Nov 03, 2010 11:22 pm. ^Well that's bizarre. Wonder what changes, if any, are going to be made. ^Jeff is one of our respected and established posters, I see no reason to doubt him. That's interesting. If anyone hears any rumors, let us know. I think trims going down the second hill would be a great idea, as you'd still get the speed from the first drop with the airtime on the third hill as well. Reality is a lovely place, but I wouldn't wanna live there.